Rocks are seriously rocking! And so are their sparkly cousins: minerals. (Beautiful, precious and incredibly useful.) Want to know more? 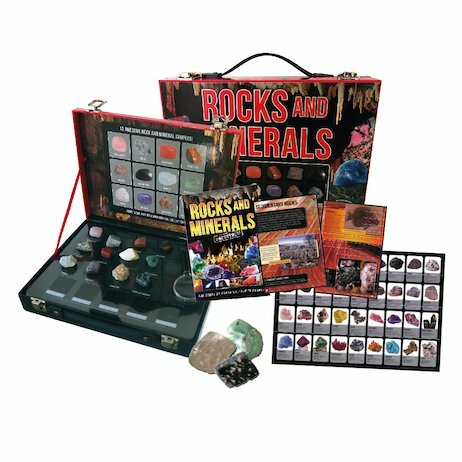 Rock out with this briefcase, which includes your own rock and mineral collection. It’s even got semi-precious stones like amethyst and green fluorite! When you know about rocks, the whole world is a treasure trove. We don’t just mean the usual suspects, like diamonds/rubies. We’re talking fossils: dead prehistoric creatures! Coal: the planet’s powerhouse! Meteorites: real-life space invaders! Stalactites: nature’s greatest sculptures! Want to learn more? Look in here! Nice poster and good selection rocks for a starter kit. Book a bit lean but my son didn’t mind.